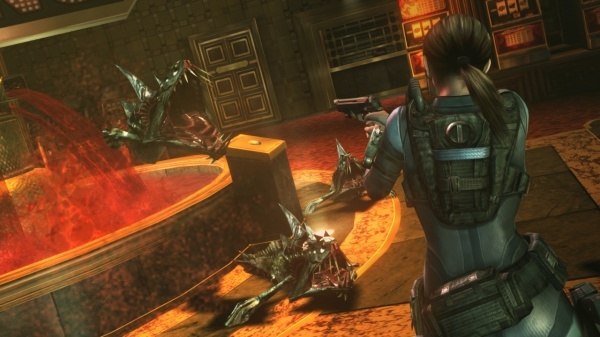 Resident Evil Revelations was first released last year for the 3DS. For a handheld RE, it was quite impressive from a graphical standpoint and the game gave us back the more horrific atmosphere that was present in older RE titles. You can read my review for the 3DS version of Revelations here on The Gamers' Temple if you want to see all that I had to say about the 3DS version since this review focuses mainly on the additions in the new console version. The console version of Revelations retails for $50. The console version of Revelations has been redone with HD graphics and they look quite nice. The 3DS version had jagged edges on characters, but the console models are very smooth and the lighting is much better. Many of the creatures in the game are much more detailed when compared to the 3DS version. The main campaign remains nearly unchanged except for a few additions. There is a new enemy known as a "Wall Blister" that takes the place of some of the usual enemies in some rooms. This enemy hangs on the ceiling and only attacks at certain times - it has an instant death grab also. Other than the new enemy, the campaign has a few item placement differences and there is a new small laser puzzle toward the end. The touch screen puzzles that were in the 3DS version have been either removed or adjusted to where you can use the thumbstick to solve the puzzle. The majority of touch screen puzzles have been removed however - only the control panel puzzles with the plugs remain. The unscrewing of the consoles, fingerprint identification and welding puzzles have all been removed and Jill will perform the needed actions for the player after examining the object. This isn't that big of a deal, but it does take quite a few of the puzzles away from the game. Little minor differences such as Jill fighting off the Sea Creeper enemies and stunning them in the process while underwater are a very welcome addition. If you've played the 3DS version, you will likely remember that Jill would fight off and push away Sea Creepers and they could simply grab her again from close range shortly after she broke free. It led to some very frustrating swimming areas in Hell mode and later stages of Raid mode in the 3DS version. Speaking of Hell mode, it has been replaced by a new Infernal mode on consoles. The Infernal mode is like a harder arrange mode. All item pickups are switched around and there is much less ammo overall. Enemies are harder much like they were in Hell mode, but they will often come at you in multiple groups, sometimes going up to four, and this happens very early on. Even before running into the first enemy, Jill will have to face off against two enemies in one of the starting corridors. The console version has a few extra outfits per character and it allows a player to switch to those outfits in the campaign and Raid mode once the campaign has been beaten. Like the 3DS version there is a New Game+ once again, and for those wondering, your equipment from New Game+ will carry over to Infernal mode. Raid mode has been improved somewhat also. First of all, it is much more fun to play the mode on a console while in online mode - that is just a personal preference from me however. Raid mode has more characters and outfits that can be unlocked this time. As already mentioned, most characters have extra outfits. Characters such as Rachel from campaign can be unlocked in Raid mode along with a few other new characters also. The game changes up the way that many of the unlockables in the campaign and Raid mode are unlocked. For instance, Quint is now unlocked after reaching level 5 now. Raid mode stages now have extra Battle Point (BP) pickups in them that can be shot or collected for extra BP to buy weapons and custom parts with. 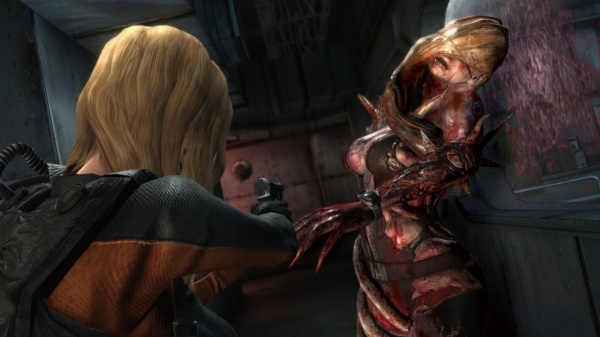 RE.net can be used to unlock extra weapons on your copy of Revelations much like the way RE6 could use RE.net to unlock extra Mercenaries outfits. Raid mode is still all about advancing through several stages of enemies and there are still three difficulties for each stage that can be unlocked along with a bonus stage. Each stage has a total of four bonuses that can be achieved while playing through a stage - no damage, kill all enemies, finish the stage with a level lower than or equal to the recommended level, and a bonus for completing all three bonuses at the same time (trinity bonus). The game encourages a player to get all of these bonuses now by listing them out and offering rewards for getting them in the console version. Raid mode can still be played online with a partner. I never had any problems with connection while playing online with random players or playing with friends. Voice commands can be used to communicate just like in other online RE games. The controls have been adjusted to fit console controls and it now has two control setups - shooter and classic. Shooter controls are much like RE5 type D controls and the classic controls are basically the same as the classic RE4 controls. The right thumbstick is used to either the character or the camera in both control setups respectively. It's very unfortunate that Capcom didn't give us the option to customize the controls for those that are more used to RE5's type B or C controls. I really have to compliment the overall swimming controls for the console version. The swimming controls are so easy to work with and feel better than the 3DS version or RE6 swimming controls. On the bad side of the controls, it's very easy to tell that Revelations was made for a handheld with how easily the characters move to the slightest press of a thumbstick and how sensitive the right thumbstick is for moving the camera when using classic controls. If you're used to console RE games, you will likely notice a difference of feel when playing Revelations - the characters move way easier. This is something that can be adjusted to after spending a few hours with the game, but it will most likely throw off your aim at first. Speaking of aiming, the console version of Revelations gets rid of the laser in favor of a crosshair - much like in RE6. There is no option to switch to a laser in the console version of Revelations however, so old-school RE fans will have to adjust to a crosshair this time. The music is still fantastic just like it was in the portable version of Revelations. You have moody tunes and several tracks that totally match the action that is taking place. The music can add a lot to the excitement of the campaign mode. There are several new additions in the console version of Revelations, but if you already own the 3DS version, it's hard to recommend buying it for the asking price. Only those that are extremely hungry for some extras for the game need apply for those that already own the 3DS version. For newcomers, I would recommend picking up Revelations since it is easily one of the best RE games that has been released in the past few years. Honestly, Revelations has a better campaign than RE5 or RE6 if you're looking for more of a horror atmosphere with your action gameplay. Final Rating: 83%. 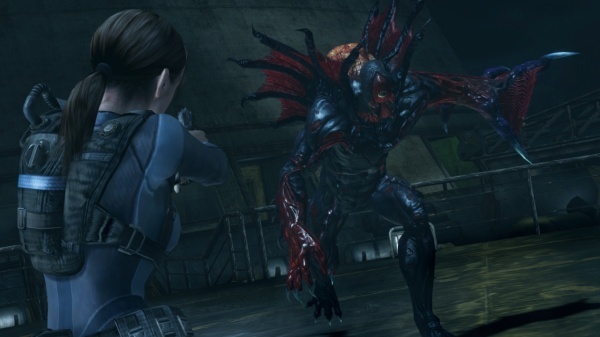 Resident Evil: Revelations is just as memorable as it was on 3DS.